Using stunning state-of-the-art video game technology, this immersive educational simulation will teach you about the sinister globalist agenda to steal your gold and how liberal despots like Barack Hussein Obama will stop at nothing to ruin the American Dream. It’s a cautionary tale that every true patriot must experience to learn essential tips and tricks to keep their precious metallic treasure safe from Democrat thugs. Be warned, this game is not for the faint of heart! 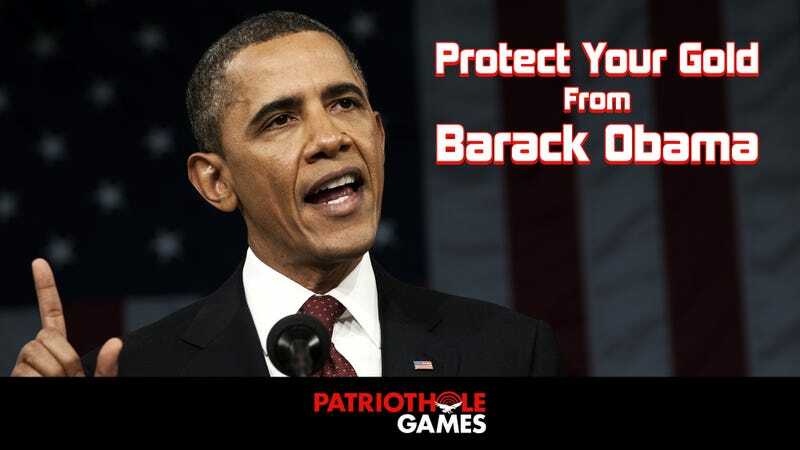 There is nothing more frightening or villainous than Prez Obummer, but we must all stand brave in the face of evil and play Protect Your Gold From Barack Obama. Play PatriotHole’s game right now in your browser and strike a blow against leftist tyranny! Huzzah!